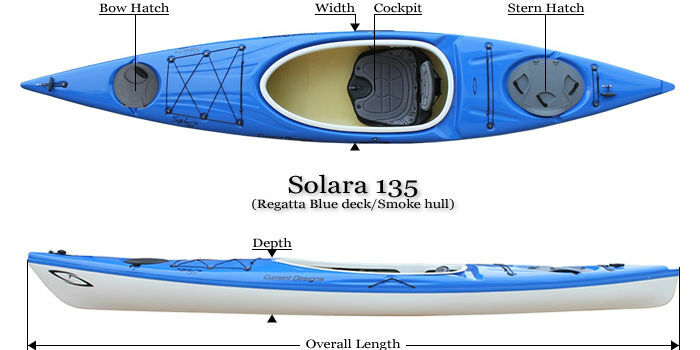 The largest of our new Solara models, the Solara 135 is nicely sized for medium to large sized recreational paddlers. Offering better tracking than the shorter models, it's a great option for beginning paddlers that want to travel longer distances. The composite hybrid layup makes this boat light weight and a pure joy to paddle across any of your favorite flat water lakes or rivers. The optional rudder increases maneuverability and tracking. Open Cockpit: The Solara's feature our largest open cockpits. These are very easy to get in and out of, and give a feeling of being almost completely free from the boat. Open cockpits have enough space to put gear between your legs for easy access.